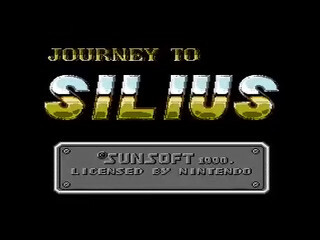 Journey to Silius was released for the NES in 1990 and developed by Sunsoft. In the year 0373, in space colony #428 in the Silius Solar System, Jay learns from a floppy disc (a floppy disc in a space colony ?) that his father's death was not an accident. Terrorists were behind the explosion that wiped out all life in the space colony. Jay decides to set out on a standard 2d platform run 'n gun adventure to avenge his father. The game is today generally considered a good game and has one of the best soundtracks for the NES. Journey to Silius was first intended to be a Terminator game, but problems with the licence called for a last-minute solution. Changes were made, but references to Terminator are still to be found. The game never got a sequel. Best Time: 0:10:20 by 'Zakky the Goatragon' on 2015-10-26. Best Time: 00:13:48 by 'ktwo' on 2009-09-06. It is hard to believe that I have been running this game for over two years. The time just passes so fast. It is also hard to believe where this run is at now. Had you asked me two years ago what my goal time for this run was, I certainly would not have even stated any time close to this one. It has been a fun journey, despite its difficulty at times as I am sure those who have witnessed my attempt sessions will attest to. I burnt out on the game a few times and had to take several extended breaks from running it. But I always came back to it. I put too much time and effort into this game to not finish what I started. Speed Boost - The most critical trick in the run. The speed value when at full run speed normally alternates each frame between 22 and 26. Pressing and holding Up at any point during the run will freeze the speed value and Jay will continue on in his current direction at that speed. It is also possible to hit a 27, but this can only happen on the frame Jay lands from a jump. This trick saves a lot of time throughout the run and many critical sections of the route depend on it. Moonwalking - This has no use as a time saving trick I( have not yet been successful in finding a way for it to be), but if you turn around backwards while jumping and hold Up, you can walk backwards. Oddly enough you can also clip through certain blocks while moonwalking. The S h i P G l i T c H (as puwexil puts it) - If you hit the kill shot on the left core of the second to last boss on the last possible frame of its vulnerability cycle, the game bypasses the rest of the fight and skips right to the final boss. This stage is fortunately short, as it is a pain execution-wise. There is a lot of precision involved and it has the highest frequency and longest duration of speed boosting. In other words, it is not only painful in a figurative sense, it also can be literally painful. There were two new strats that I used in this stage that I did not use in the previous run. The first was the “Pasky Strat”, as I call it, as it was a strategy Pasky used back when he ran the game. Instead of ducking and shooting to destroy the mine across the first pit, as in the previous run, I jumped and fired a few shots off instead. This destroyed the turret on the ledge across the pit and allowed me to keep moving forward without pause. The second new strat was in the area that I destroyed a second mine in my previous run. I did not stop to destroy the mine on the small ledge before moving forward, this time. I jumped to the very lip of the edge and then immediately jumped up again to get over the mine, firing shots to destroy the missile launcher and jumping bot. Then another short jump was required to clear a one missile. The boss fight was acceptable, but my timing was just off in this particular run that I missed the four-jump kill and had to take an extra jump. I made it up the first set of stairs without any problems which was really nice. Then I got the skip, falling cleanly between the second rotating turret’s bullets and not getting shot until falling down from the ledge underneath. I used the invincibility frames from the hit to run through the next rotating turret. Then I managed to get the speed boost for the short run to the cannon on the lower level and then accidentally ran into the cannon. Whoops! Everything went pretty well from then on and I even made it up the last set of stairs cleanly, even though it feels like I should have cleared it one jump earlier. The miniboss fight was not quite perfect. I fell short a shot or two of killing it and then had some brief trouble hitting the last shot. That was disappointing, as the fight should have been better, but it was at least not the worst that fight could have gone. The boss fight went perfectly, though. In two prior PB runs I died in this stage, but got bailed out by the S h i P G l i T c H. Needless to say, that did not happen this time. I used my new strategy for the end of stage “Gauntlet of Hell” and almost got trolled by the second to last flame mine. Fortunately, it activated early enough for me to stop and I had enough time to wait it out and still avoid being caught by the bots that were in pursuit. The miniboss fight went well and even had a quick-grab of the Laser. I did make a minor positioning mistake on the boss and end up getting shot by one extra bullet, but overall a pretty nice stage. This stage started off fairly smoothly. I turned back briefly while in the passage just after the first elevator to reposition the camera and avoid taking a hit from the second set of moving spikes. I missed getting the one jump descent down the shaft just past the second elevator, but recovered quickly. I was not able to get the speed boost until after the second falling block, so I had to resort to my back-up strat for the first part, but up until disembarking the next elevator everything went very nicely. Everything started off fine, but I did not position for/time my jump correctly over the spike block and took a hit. I then realized a bit too late that I could have just immediately jumped and avoided the second flying bug and ended up taking a hit from it. A little bit further on I mistimed a very tight jump under a spike block and took I hit. I again shifted to my back-up plan and intentionally took a hit from the flying bot so I could just run past the jumping bot on the ledge above. I failed to mash fast enough on the next jumping bot and took a hit and then had a two-jump descent down the final shaft, but everything went well after. I used another new strat on the Stage 4 boss; hitting three missiles on one cycle to defeat the boss a cycle earlier than in my previous run. I wasted those four missiles intentionally so that I could start on the regular gun for the next level without a menu switch. After getting the S h i P G l i T c H a second time in a PB, I ensured that I could never PB again without it, hence my name for this stage. The stage itself went by rather uneventfully, though I did throw in a moonwalk for swag around halfway through. Thoughts of this part of the run were once some of the most discouraging. All the hopes of the run were riding on a shot that I had an extremely slim chance of hitting correctly. Then I found a setup that removed some of the variables. By standing in a specific position and waiting for the ship to drift over and hit Jay, I could always ensure he took the damage from the ship when in the same position everytime. From there I was able to buffer the run to the left. This meant that all I had to do was time the jump and the shot. It still was not a guarantee, but it increased the probability of hitting the glitch. I had trouble positioning Jay and I even thought I was positioned incorrectly. The game proved me wrong and S h i P G l i T c H! Then somehow I held it together long enough to get a perfect boss fight and a gold split to wrap up the run. Whew! ktwo for the many helpful suggestions time and time again and pushing me to put my best effort forth. Also he had the first run of Journey to Silius on SDA on the PAL version and it served as a basis for my original route. reaif, RetroChristian, and Primal, other who have run this game and from whose runs I have taken strats that I have used in my route at one point or another. Mattrick_ for helping to point out some small things that looked obvious after, but ended up having a major impact (especially on the Gauntlet of Hell at the end of Stage 3). Pasky for the “Pasky Strat” mentioned above. Mr. K for pushing me to get back to attempts of this game during my breaks. And to way too many others; my stream viewers, all those who raided/hosted me during attempts, and to the many runners whose determination on their own runs kept me telling myself that if they could do it, then so could I. Introduction First of all, sorry for not dancing around that much in this run. I have only one signal splitter, which is used for the video signal (for obvious reasons), and thus no sound to help me keep the rhythm... To understand some of the tactics employed in the run, it's important to be aware of how Jay's position on the screen works. Correctly used, changing Jay's screen position can help avoiding enemies/enemy shots, obstacles and set up a favorable timing for moving without stopping. Anyways, the screen will scroll at the same pace as Jay when he is moving (horizontally or vertically). However, if Jay gets hit, the sprite will "advance" or "reverse" on the screen, depending on if the hit was upfront or in the back. Another way to manipulate the screen positioning is after leaving an elevator while the screen is still scrolling vertically. Boss phase 1 - Very good luck against these random enemies ! My strategy (small jump and spam) works against most things the "robo-grasshoppers" can do, but won't assure you a quick win. I would easily have settled for a 5 second slower fight. If #1 would have behaved like #2 and #3, maybe half a second more could have been shaved off. But by all means, #1 also behaved extremely well. I duck a couple of times to shoot mines. The last two mines can be bypassed without stopping, but it would drastically decrease the number of runs getting past this level. Maybe 1 second lost ? The hit I take from the canon is avoidable, but precise timing is required in order to shoot it first. With precise timing, it's possible to pick up the M immediately when the pre-boss goes down. Timing wise a difficult trick. Saves 0.5 seconds. Level - Ok. All hits are intentional. I wait for a second after the second elevator has arrived. The reason is to get the right screen positioning (preferably as close to the center as possible) in order to avoid the bullets from the rotating turret near the end and to give me the right position at the pre-boss fight. Pre-boss - Sort of ok, but I can do it in one jump less. 1 second lost. It's possible to make the jumps up the first steps without stopping like I did in my run. Harder, but doable. I should have jumped off the first ledge to descend with maximum vertical momentum. Small time saver, but stuff like that is risk-free and should have been done. It's possible to not get hit by big turret, just before the first elevator. Apparently a 1-frame trick. The TAS clears the first two elevators in an alternative way. The method shown in my run worked out well for a console run, but more testing could probably lead to being able to implement something similar to the TAS-strat. It's possibly faster to fire off some missiles in order to exactly run out of weapon energy in the end (saves a weapon change at the start of level 3). The time gain is probably pretty insignificant though (the time refilling the energy at the end of the level has to be taken into account also). Not to mention that it's hard to pull off shooting two missiles at each jump that connect (I miss one in this run as an example). Level - The toughest and most random level. Every flame mine and wall-crawling spider can hit you at will without possibility of dodging. I take a couple of random hits, which is nothing remarkable. I prefer to see it as I got lucky if I didn't get hit rather than saying that I got bad luck if I got hit a few times. Compared with previous attempts, the mistakes/bad luck meant losing around two seconds until the last elevator (note that I take a few intentional hits after the first elevator to manipulate the screen position and making it possible to run past the laser barriers without stopping). Maybe two more seconds were lost due to bad luck on the laser barriers right before the boss (but that's assuming perfect luck, I'm actually not complaining over the pattern I got). Pre-boss - Ok. While it was unintentional this time, I usually try to fire away an extra missile before picking up the L. The reason is that I want to completely deplete the weapon energy at the end and thus avoid a weapon change in level 4. On most jumps on the boss, you can fire away two missiles at once (like on the level 2 boss). The timing for getting both missiles to connect is tricky though and any miss would leave you with the normal gun for cleaning up the mess in the end. A perfect fight would save 4 seconds. Considering how hard it was for me to get here in the first place, I traded those risky 4 seconds for a fool-proof strategy instead. Another possibility is to do the TAS-strat of move to the right and take out the boss at close range. I couldn't come up with any viable way of doing that, but I admit that I didn't try it out enough to completely dismiss it either. After the second elevator, it's possible to jump over one of the "half-circle turrets". It requires a precise jump, but would save half a second instead of stopping to shoot it. The section right after the last elevator is interesting. The flying enemies are very hard to dodge. I didn't come up with anything that was even remotely feasible such as running and gunning through the whole thing. Still, with so much time spent not advancing forward, there is always that gnagging feeling that there is a faster way to do it. Level - Long and tough, but not as random as level 3. Most of it goes ok, but I lost a bit of time here and there from getting stuck on some steps etc. It's worth mentioning that all hits I take in this level are intentional. Either to manipulate the screen position or simply because I didn't find a way to avoid them. There is also an oddity when jumping down the last shaft. I turn around and run the wrong way for a bit. The reason is that I was too far to the right for the screen being able to start the vertical scroll, so I had to drag it a bit more to the right first. Not doing that gets you infitely stuck. With the route I take, that always happens, so it's pretty easy to prevent, but is of course an annoying time loss. Pre-boss - Ok. When watching it again, I'm actually not sure if it's faster to jump and take the G. Maybe it's faster just waiting for it to fall down ? The TAS used missiles against the pre-boss, but I haven't found a way to get anything decent out of that. li>After the second elevator and right before two consecutive "giant, jetpack enemies", I stopped and waited for an enemy to fly by. It's possible to jump and shoot that enemy while turning around. It would have saved one second. The G can be picked up in the same jump as the last shot, saving maybe half a second. Shooting two missiles every time on the boss would take him down in 5 cycles instead of 6 with grenades. This would save around 3 seconds, but the gain has to be offset also by an extra weapon change to grenades on level 5 (1.5 seconds). I'd say this is probably the easiest time saver to implement of the ones suggested. Boss - The goal is to save as many grenades as possible for later use against the alien boss, but still take out both sides of the ship in one cycle. I got nervous and lost one second on the right side when starting to jump too early and then got hit by a bullet. I thank the tas for showing me the neat trick of shooting the vulnerable parts from the inside. The TAS uses the normal weapon for the final boss. During the preparations for this speedrun, I did not try out that strat enough to get it to work and therefore don't know how much that could save. Since then, I know some other players have gotten it to work consistently console though, so there is potentially a few seconds to gain over my run. Competition (as of writing - early 2013) I have found traces of times reported by Japanese players. The best reported time is 11:17 and the second best is 11:37 (rta-timing). I've ran some quick emulator tests and it seems like the pal- and the ntsc-versions run on the same speed in terms of frames. This means that the 5/6 rule can be applied to compare times, but it's very possible that ntsc is at a slight disadvantage in that comparison due to lag. These times would then translate to 13:25 and 13:49 on pal (sda-timing), respectively. So one would be faster than my run and the other slightly slower (but comparisons between pal and ntsc should of course be seen as purely theoretical when it comes down to a few seconds of difference). The site I found these times on doesn't have any videos to watch. Personally, I think it's healthy to express some doubts about times without available videos. However, I also think that the Japanese players have surprised us western players a few too many times to dismiss reports of good times by default. Another fact that speaks in favor of the legitness of these times is that the best reported time was achieved by a certain... Hotarubi... While my run is far from perfect, I believe that a "perfectly" executed run with perfect luck and the implementation of all the above mentioned improvements would still fall a few seconds short of 13:25. An interesting fact is that the two best Japanese times (along with a few slower times) were achieved on the same day. So possibly some kind of race was held on that day. It'd be surprising if fully optimized runs were performed during race conditions on the same day, so that means that there is maybe even more potential for dropping the time (but that's me speculating wildly...). When I started playing Journey to Silius, there hadn't really been any speedrun activity for the game. Since my run was completed, I'm aware of a few western players that have worked on speedruns for the ntsc-version. As far as I know, there are no reports of times that are close to those from Japan though. Final thoughts All in all, I can see around 4 seconds of glaring execution mistakes and maybe 5 seconds could have been gained with perfect luck. On top of that, I played it safe and lost around 10 seconds from not using the riskier, but still human, strategies that I was aware of at the time of making this run. There are of course also the always present time savers like more precise turning skills, being better at button mashing etc. As for me, this run is pretty much how far I'm willing to push the time. I do however hope that this game will get more attention from speedrunners in the future and that someone steps up to challenge those Japanese times. Credits - SDA for publishing this run and for providing the community with a non-commercial platform for hosting speedrun videos. - Anyone who has contributed to the development of Anri-chan. If a tool is so easy that even I can encode videos, then it must good! - klmz for having assisted me with useful information about how to perform some of the tricks in this run.